These vegetables are fine warm or at room temperature, so grill them before the main course. 1. Light grill fire. Combine oil, garlic, thyme, and salt and pepper to taste in small bowl. Place vegetables on platter; brush both sides with flavored oil. 3. 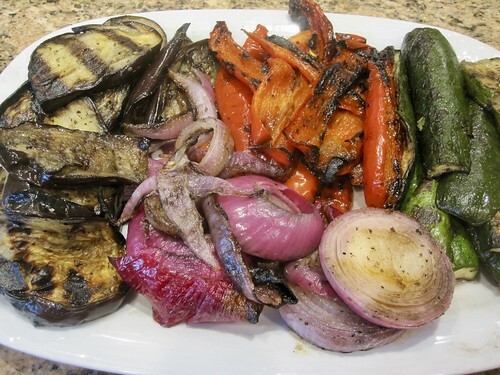 Grill uncovered, turning onions frequently but other vegetables just once, until everything is marked with dark stripes, 5 to 6 minutes for onions and 8 to 10 minutes for zucchini, eggplant, and pepper.